The Declaration of Independence was the name adopted by the Continental Congress on July 4, 1776, which announced that the thirteen American colonies, then at war with Great Britain, regarded themselves as 13 newly independent sovereign states and no longer a part of the British Empire. They formed a new nation—the United States of America. Times were much different when our founding fathers lived. They cooked over open wood fires and often had farms where they grew their own produce. Food was simpler for the,. but eating was a big part of their lives. What kinds of food did our founding fathers eat? Thomas Jefferson was known for his culinary adventurousness. He was an avid gardener and trained his kitchen staff in French cooking techniques. Almost all of our founding fathers lived on large farms. Thomas Jefferson, in particular, had a deep love for farming and he published many books about it. In his Garden Book, he mentioned planting green beans often. Everyone knows the myth about George Washington and the cherry tree, but did you know that he actually had a cherry orchard on his property? Both he and Thomas Jefferson cultivated cherry trees on their land. Seafood in general was popular amongst the founding fathers. Most of them spent a lot of their working lives near large bodies of water. Even though they enjoyed all seafood, oysters were by far their favorites. Martha Washington, the first First Lady, included many recipes for oysters in her cookbook, The Martha Washington Cookbook. Benjamin Franklin loved turkey so much that he suggested it should be our national symbol. The bald eagle won that fight, but turkey continued to be popular. Dolley Madison, the fourth president’s wife, introduced ice cream to the United States in 1812, when she served it at her husband’s inaugural ball. It’s common knowledge that George Washington had dental issues. For most of his life he wore dentures, so he often couldn’t chew foods properly. Because of this, he preferred soft, easy-to-eat foods. Cornmeal cake was one of his favorites. George Washington also brewed his own beer. He included molasses in his recipe. John Adams, the second president, had a relatively simple palate. He preferred boiled meals with nothing too elaborate added. His wife, however, liked to cook more interesting meals. Each year, Abigail Adams would make apple pandowdy, which is very similar to apple pie, from the harvest from their orchard. Apple cider was John Adams’ drink of choice. It was also made from the apples that grew in his orchard and he drank at least one pint of cider before nine in the morning. 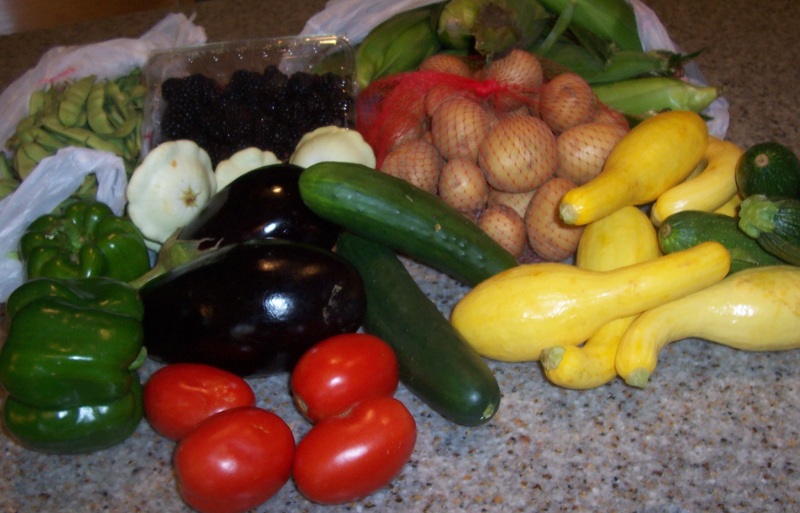 The colonists were not fond of eating fresh fruits and vegetables. In fact, they were considered unappetizing. Most of the time, a lot of sugar was added to the cooking water to make the vegetables more palatable to their taste. 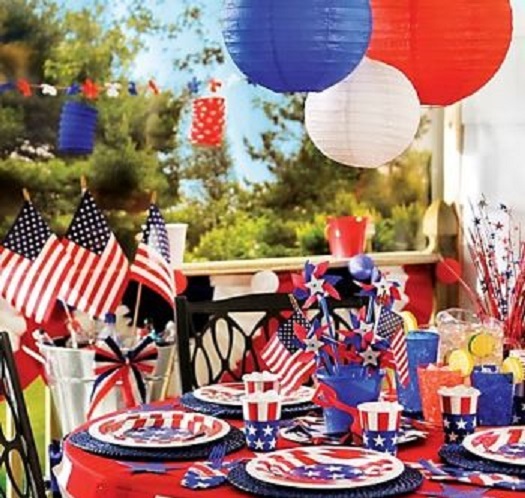 Today, Independence Day, a national holiday, is commonly associated with fireworks, parades, barbecues, carnivals, fairs, picnics, concerts, baseball games, family reunions and political speeches and ceremonies in addition to various other public and private events celebrating the history, government and traditions of the United States. 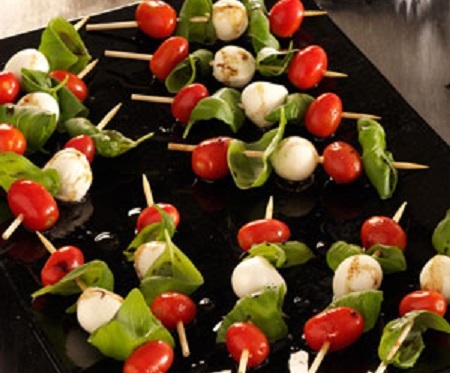 On each of 12 wooden appetizer skewers, alternately thread two tomatoes, one cheese ball and two basil leaves; place on a serving plate. In a small bowl, whisk the oil and vinegar together and drizzle over the kabobs just before serving. Yield: 12 kabobs. In a large bowl, combine all the ingredients and mix gently. Refrigerate, covered, at least 4 hours or overnight. Yield: 12 servings. Place potatoes and sausage in the bottom of a large stockpot. Fill with 6 quarts cold water. Stir in the seafood seasoning, cover and bring to a boil; cook 10 minutes. Remove the lid and carefully add the corn; cover and cook 10 minutes. Stir in shrimp and cook 2 minutes, or until the shrimp turn pink and are cooked through. Drain. Arrange on a large platter and garnish with chopped parsley. 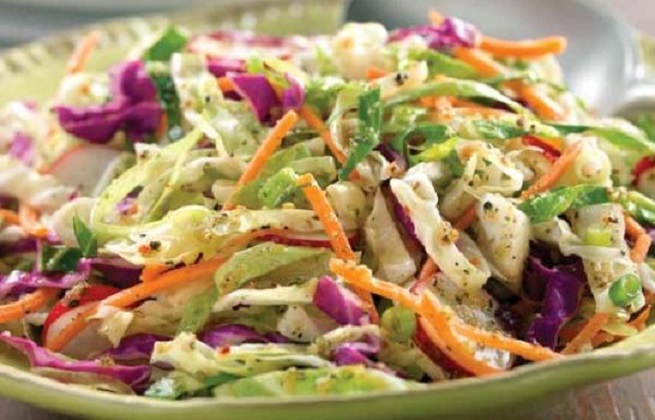 In a large bowl, stir together the green cabbage, red cabbage and carrots. 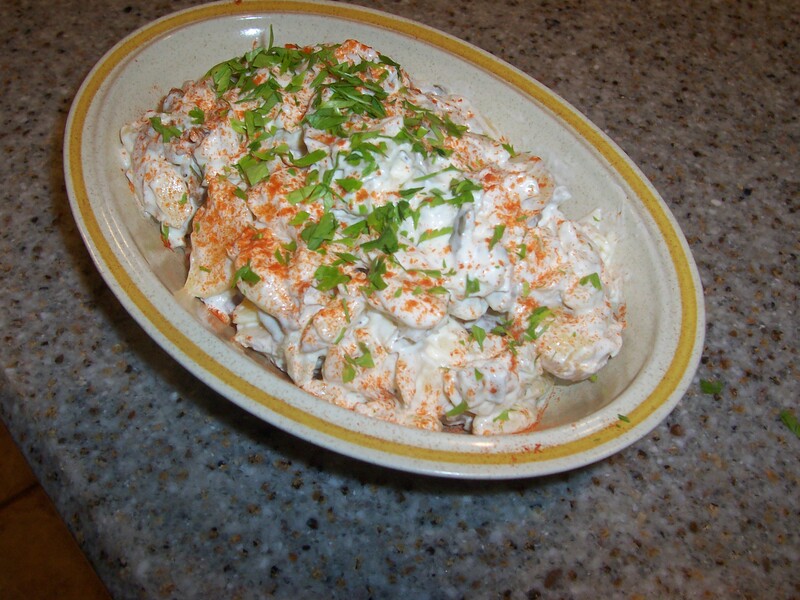 In a medium-size bowl, whisk together the mayonnaise, sour cream, buttermilk, mustard, salt and pepper. Fold the mayonnaise mixture into the vegetables and stir until well combined. Cover and refrigerate 4 hours or overnight. This fat-free, all-fruit sorbet adds lemon for refreshing tartness. For a smoother texture, strain the blueberries through a fine-mesh sieve before freezing. For a blueberries-and-cream variation, substitute milk or cream for the juice, omit the lemon and add 1 cup Greek yogurt. In a small saucepan, warm the juice and add the honey; stir until completely dissolved. 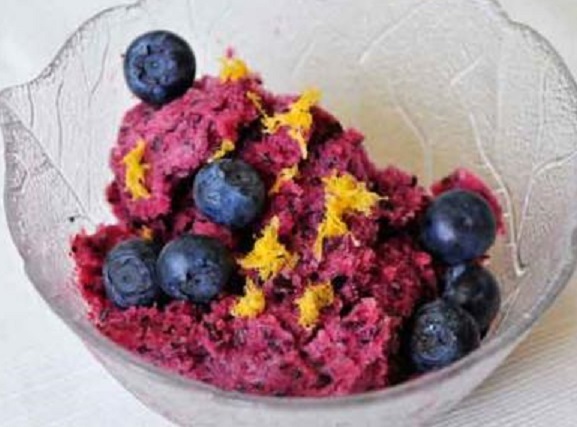 Combine with 6 cups blueberries in a food processor and purée until smooth. Strain, if desired. Zest and juice the lemons. Add lemon juice and salt to the blueberry mixture and pulse to combine. Pour into a prepared ice-cream-maker canister, stir in all but 2 teaspoons of the lemon zest and freeze according to the manufacturer’s directions. To serve, place one scoop in each serving dish and garnish with remaining lemon zest and remaining blueberries. Serve immediately. Lake Bolsena is a crater lake of volcanic origin in central Italy, which began to form 370,000 years. It is the largest volcanic lake in Europe and is the fifth largest lake in Italy with a circumference of over 26 miles (43 km). 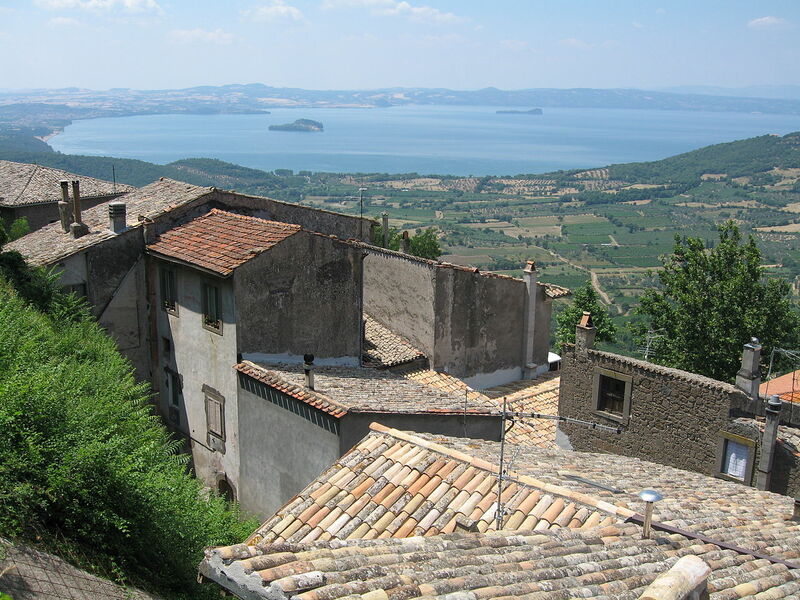 Lake Bolsena’s bed was formed from a caldera in the extinct Vulsini volcano. A caldera is a volcanic feature formed by the collapse of land following a volcanic eruption. The underlying rock in the area where the lake formed, the caldera, collapsed into a deep bowl. This bowl was gradually filled by rain water and underwater sources. Roman historical records indicate volcanic activity last occurred there in 104 BC and it has been dormant since then. The two islands, Bisentina and Martana, in the southern part of the lake, were formed by underwater eruptions following the collapse that created the caldera. The lake is fed primarily by underground springs and rainwater and has a single outlet, the river Marta that flows into the Tyrrhenian Sea, in the vicinity of Tarquinia. The lake has an oval shape, typical of crater lakes. The long axis of the ellipse is aligned in a north-south direction. The entire lake is surrounded by hills and is a good vacation spot. It has beaches, a harbor, restaurants, hotels and a medieval historic center surrounded by walls with a castle at the top. On the lake one can enjoy water sports, from canoeing, water skiing, sailing to surfing. Unlike most lakes, Lake Bolsena displays tidelike movements, called “sessa” with the difference between low and high tides being as much as 50 cm or 20 inches. Lake Bolsena is north of Rome in the Northern Lazio region, just south of Tuscany. Bolsena, the main town on the lake, is on the northeastern shore. In the 7th century BC, it was the site of a Villanovan settlement whose huts were built on stilts directly over the water, using reed platforms, hay roofs and cobbled floors. About four hundred years later, it was settled by the Etruscans after they fled from the Roman destruction of Velzna in 264 BC. Velzna eventually became Volsinii, a Latin name which has been transformed over the centuries into Bolsena. The Rocca Monaldeschi della Cervara sits at the top of the hill, overlooking the medieval quarter of the town. The castle was built between the 12th and 14th centuries. It has been completely renovated and, since 1991, has housed the Museo Territoriale del Lago di Bolsena (Lake Bolsena Territorial Museum). Each of its three floors is dedicated to various aspects of Bolsena’s history, ranging from its prehistoric volcanic origins to its Etruscan-Roman period. The Church of St. Christine is the town’s other major site. It is a Romanesque church built in 1078 in a typical basilica style over the catacombs where St. Christine, a young woman martyred during the reign of the Roman Emperor Diocletian, was buried. The territory of Lake Bolsena brings with it a whole host of ancient traditions that are also reflected in the local cuisine, with flavors and products typical of their ancient recipes and cooking methods. It is also famous for its clear lake waters and the nickname “the lake with a drink. Long ago, lake water was used in cooking. Fishermen prepared the Sbroscia in a clay pot using freshly caught fish; it was one of the few means of survival, when they had little more than what the lake could offer. It was prepared within the small hut on the shore that was used as a refuge and as a warehouse for their supplies. Acquacotta is the name of a typical local soup prepared with chicory, potatoes, tomatoes, onions, hot pepper, dried cod, dry bread and olive oil. 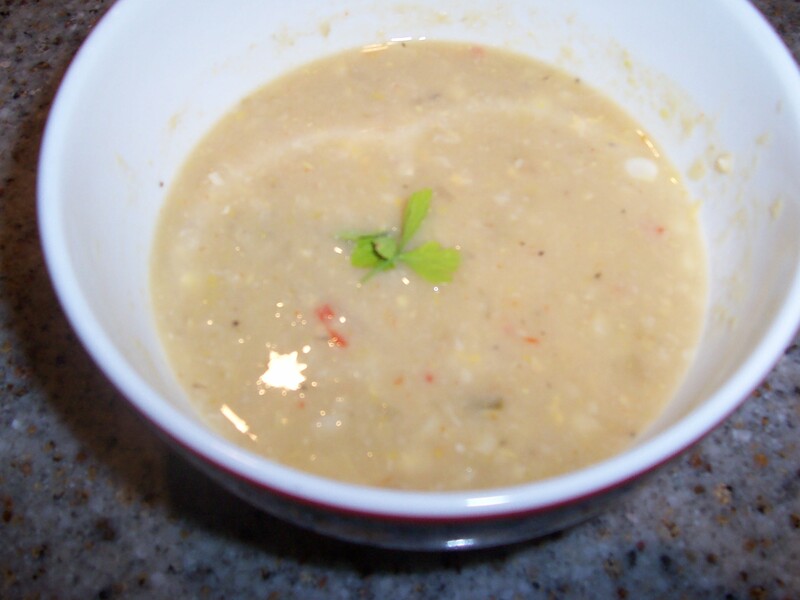 Other soups of the local cuisine are made with mushrooms, legumes, chestnuts, lake fish (sbroscia) and lamb. First courses often include rice and lentils, pasta and potatoes, rice and chicory, peas with quadrucci (small squares of hand-made egg pasta) and “minestrone alla Viterbese”. 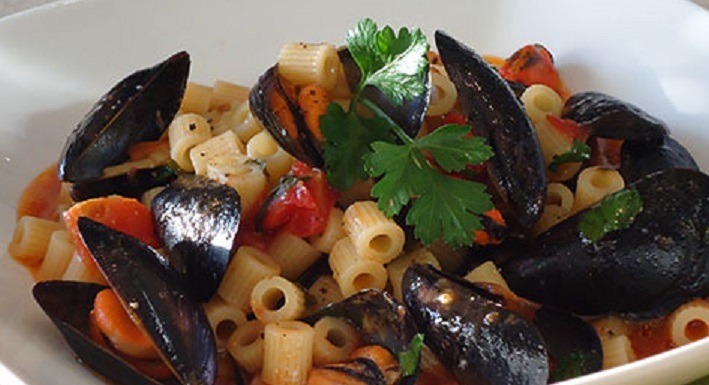 Pasta dishes include maccheroni, ceciliani, lombrichelli (made with only flour and water), potato gnocchi, fettuccine, pappardelle, gavinelle or polenta. 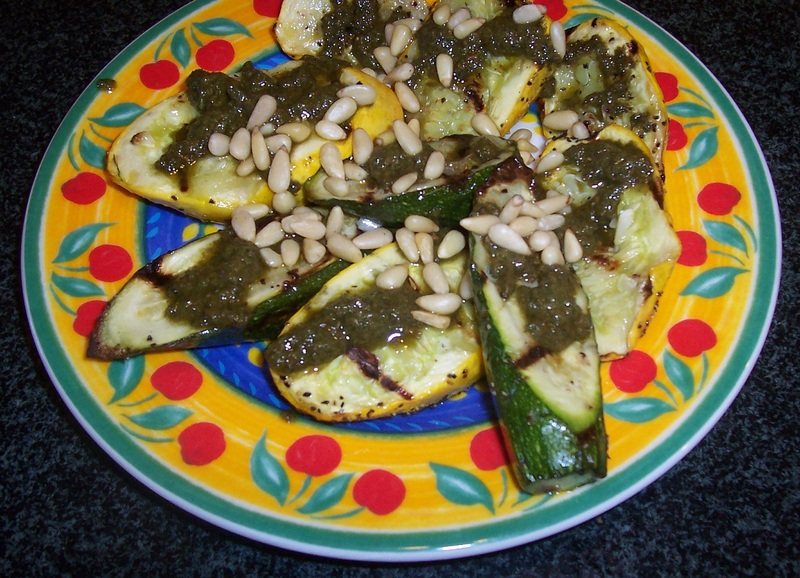 These dishes are often served with a classic ragout – meat sauces prepared with hare, wild boar, mushrooms, spare ribs and pork sausages or, in summer, with fresh garden vegetables, such as: zucchini, eggplant, turnip greens or sweet peppers. For main courses, rabbit alla cacciatora, stewed chicken with tomatoes, wild boar with tomato sauce, stewed hare, baked lamb, tripe with tomato sauce, fried coratella (veal intestines), roasted pork or pignattaccia (a stew made with meat and vegetables) are most common. 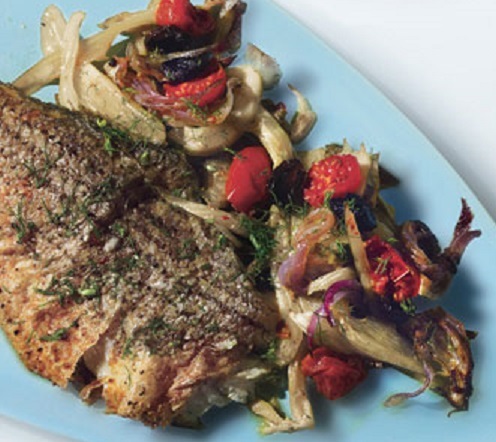 Main fish dishes, prepared with lake fish, include: fried perch fillets, stewed eels, fried lattarini, stewed or fried pike and baked or grilled whitefish. 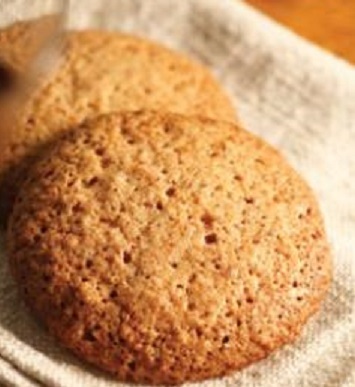 Typical desserts include: sweet ravioli made with ricotta, ciambellone (simple white cakes), tarts made with ricotta or jam, crunchy biscuits and cookies made with hazelnuts and sweetened fritters made with rice. 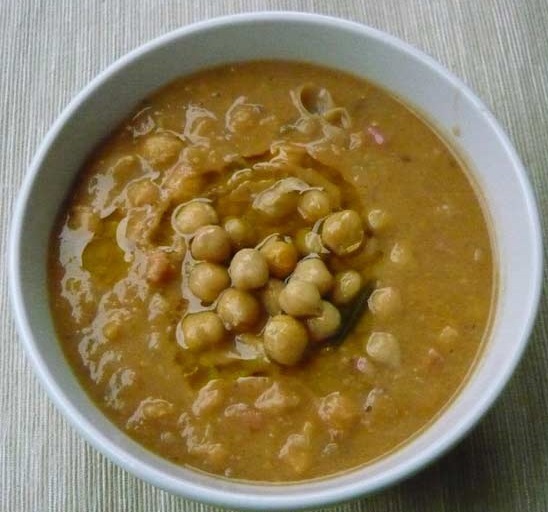 This ancient soup recipe of chickpeas and chestnuts is one of the typical dishes of the area. Cover the chickpeas with water in a bowl and soak for about 24 hours; drain and pour into a pot with water to cover. Cook until the chickpeas are softened, about an hour; add the salt. Drain the chickpeas; set aside a 1/4 cup of the cooking liquid and puree half the chickpeas. Chop together the garlic, rosemary and pancetta. Heat a little extra virgin olive oil in the pot used to cook the chickpeas and cook the pancetta mixture for a few minutes. Add the pureed chickpeas, the whole chickpeas, the cooking water and the chopped chestnuts. Cook the mixture for 5 minutes, then add the diced tomatoes and the bay leaf. Mix add the broth, stirring well; let the mixture simmer for 10 minutes over low heat. Remove the bay leaf before serving. 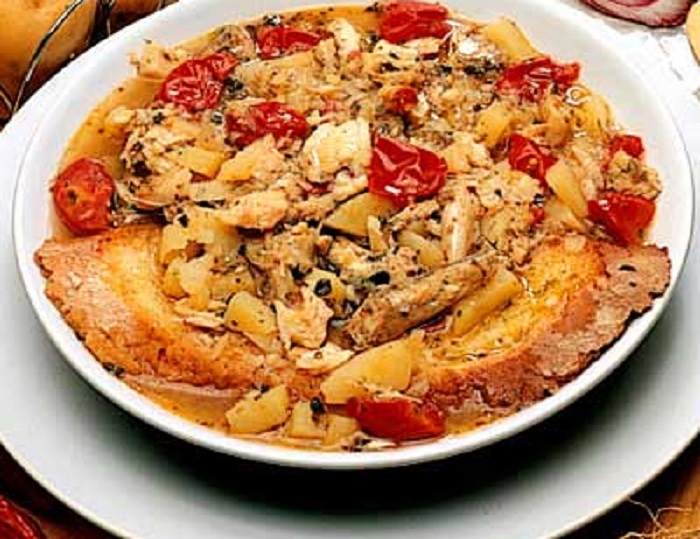 Sbroscia is a stew of fresh fish from the lake. There are many species of fish that inhabit the lake: whitefish , eel , pike , tench , trout, perch and silversides are a few examples. Any combination of fish may be used in the recipe. Cut the fish into serving pieces. Heat two tablespoons of olive oil in a Dutch Oven or large soup pot. Add the garlic, mint and onion and cook until the onion softens. Add the potatoes and tomatoes and saute for a few minutes. Add all the fish, 6 cups of water and salt to taste, cover the pan, and cook for 30-35 minutes. Place 3 to 4 slices of bread in each serving bowl and pour in the stew. 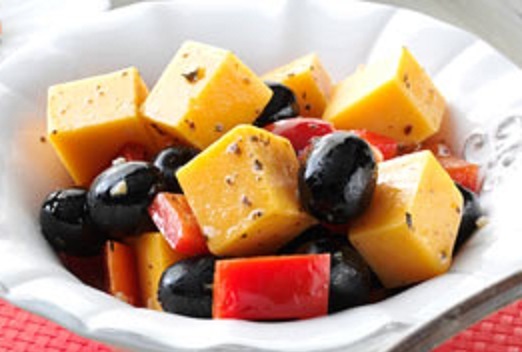 Drizzle with olive oil before serving. 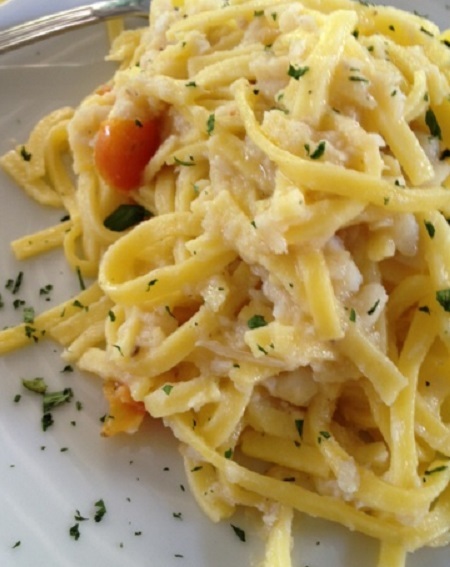 The whitefish sauce is served with fettuccine or spaghetti. Saute the onion and garlic in a large skillet. Add the whitefish fillets and saute until cooked through. Break up the fish into smaller pieces. Add the wine and cook until it evaporates. Add the fresh tomatoes and cook until no longer raw. Season with salt and the crushed red pepper. 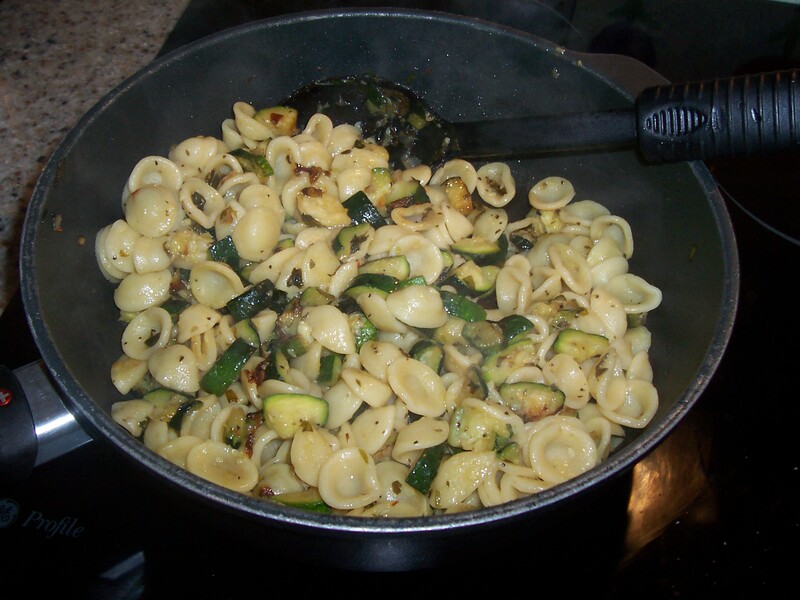 Mix in the cooked pasta and garnish with chopped parsley. 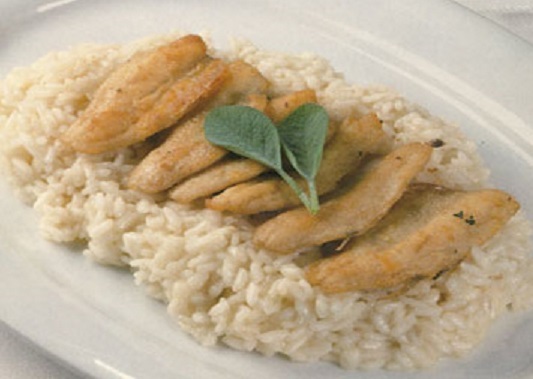 This risotto uses the freshwater perch in the starring role. In a heavy saucepan, heat 1 tablespoon butter until it melts. Add the chopped onion and cook until it is tender. When the onion becomes transparent, add the rice to the pot and mix it well. Let it cook for a couple of minutes. Then, add the wine to the pot. Mix the rice until the liquid evaporates, then add the broth, a small amount at a time, stirring it constantly to allow even absorption of the liquid. When the rice is just about tender, add the salt, pepper and cheese and allow to melt. Meanwhile, to cook the fish – batter the fillets in the flour or bread crumbs and then cook the perch in batches in a hot skillet using some of the remaining butter. Turn the fillets over once and cook until each side is golden brown. Repeat with remaining fillets and butter. Spoon the rice onto a serving dish and top with the fish fillets. Just a note to add an additional Italian twist to this risotto: heat some butter in a pan and add a handful of sage leaves. Let the butter melt and become infused with the herbs. When the risotto is ready to be served pou,r the butter sauce over the fish. 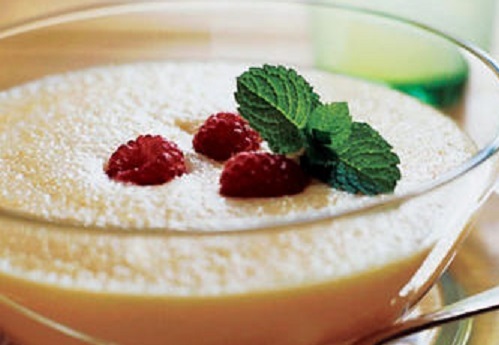 Cook the rice in the milk, watching very carefully that it doesn’t burn or overflow – don’t take your eyes off it! You will need to stir it quite often to make sure it doesn’t stick and burn on the bottom. When the milk has been mostly absorbed and the rice is very soft, take the pan off the heat and add the citrus zest and sugar. Set aside. Once completely cool, add the wine, eggs, baking powder, salt and flour. Combine thoroughly then cover and let the mixture rest for several hours or overnight in the refrigerator before using. The mixture may look quite runny, like a pancake batter. 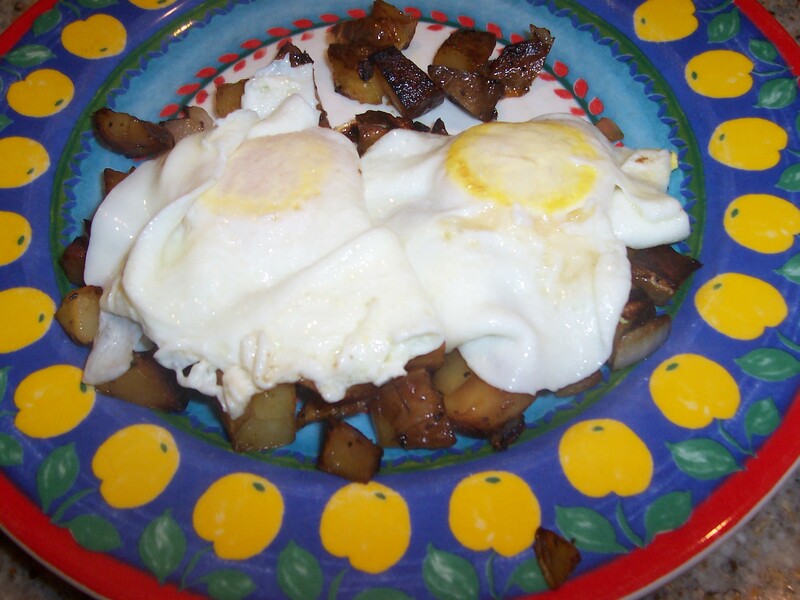 Drop tablespoons of batter into hot oil, and fry, turning to cover all sides evenly until a deep brown. Transfer to paper towels to drain before rolling in powdered sugar. These are best eaten the day they are made. You think fruit, then dessert: fruit pies, fruit crumbles, fruit crisps, fruit compote on spongecake, fruit in ice cream or fruit on its own. When it’s hot and you need something refreshing, summer fruit fills the need– from tart blackberries to sweet strawberries to juicy peaches. 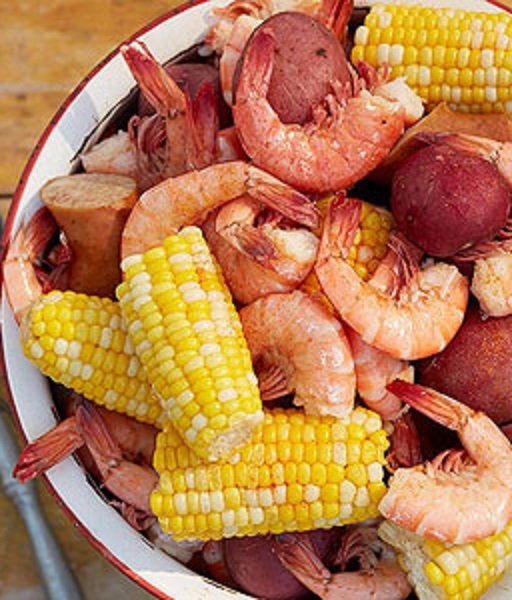 However, there’s a savory side to summer fruit, that definitely deserves your attention. 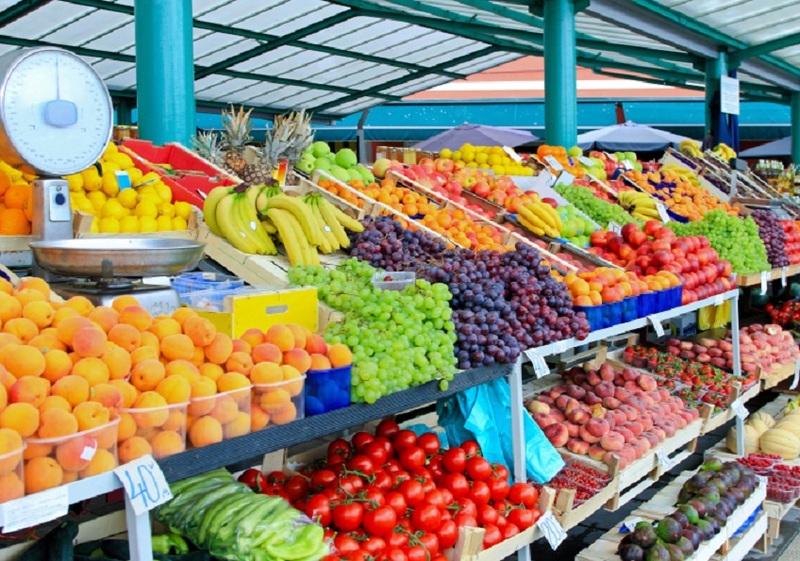 Fresh fruit, summer fruit in particular, can really add something special to your recipes. When combined with the right ingredients, summer fruit can take on a savory flavor that’s far from a dessert — and just as good. I have included both desserts and savory dishes in the recipes in this post. Chopped salads add a splash of color to a meal. If you’re making this salad in advance, keep the salad and dressing separate and hold off adding the tomatoes and avocado until just before serving. You can substitute vegetables that are in season for some of the ones listed in the recipe. 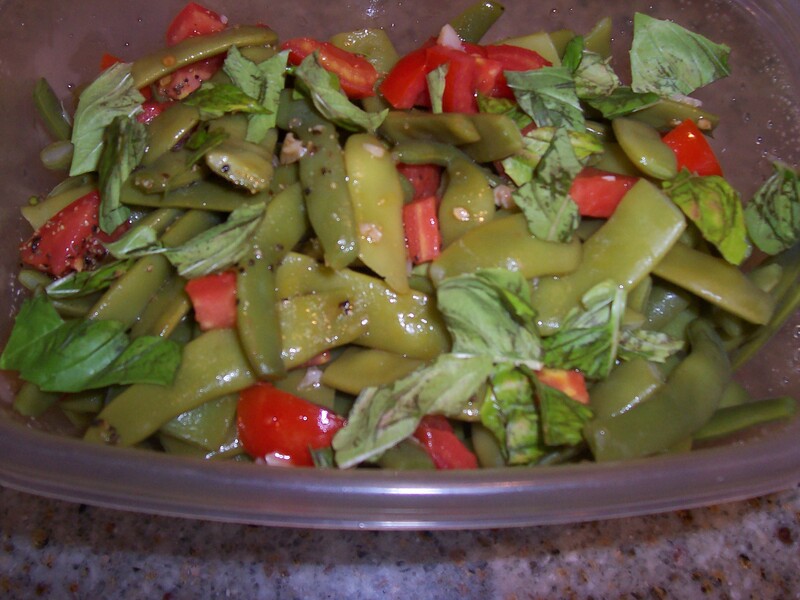 In large bowl, combine chopped tomatoes, green beans, bell pepper, radishes and radicchio. 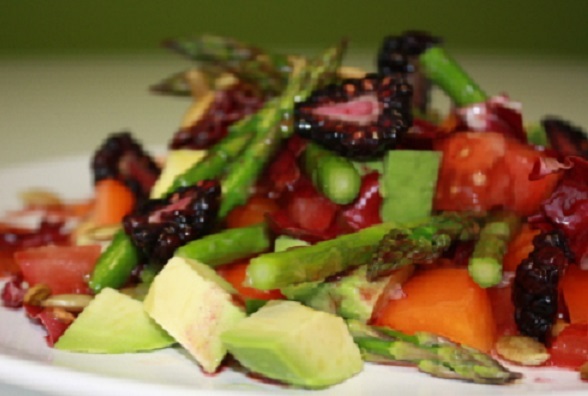 In a separate small bowl, toss avocados with lemon juice to coat and then fold into the salad. Set a fine-mesh strainer over a small bowl and place whole berries for the dressing in the strainer. Using the back of a wooden spoon, mash berries through the strainer to separate the juice from the pulp and seeds. Discard pulp and seeds. Whisk together the blackberry juice, shallot, olive oil, red wine vinegar, maple syrup, lime juice and salt and pepper to taste. Drizzle desired amount over the salad. You may not need to use the entire amount of dressing. 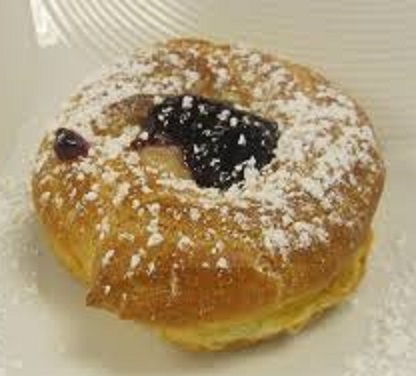 Top with pine nuts, the halved blackberries and serve. Serves 4. In a blender or food processor, puree cantaloupe, peaches, white Zinfandel and lemon juice until smooth. Taste and add honey if desired. Pour soup into a container, cover, and chill until cold, at least 1 hour or up to 1 day. To chill faster, nest container in a bowl of ice water and stir soup often until cold, about 30 minutes. Combine vinegar and brown sugar in a small saucepan and bring to a boil. Reduce to a very low simmer and cook for 10-15 minutes, until the liquid is slightly syrupy. Remove fromthe heat and pour the vinegar into a glass measuring cup. Set aside to cool and thicken. Cut the nectarines into ¼ inch thick circles, going around the pit and keeping the slices whole. Heat a large skillet over high heat. Add 1 teaspoon of olive oil and sear both sides of the nectarines for 1 minute or until warmed, but still firm. 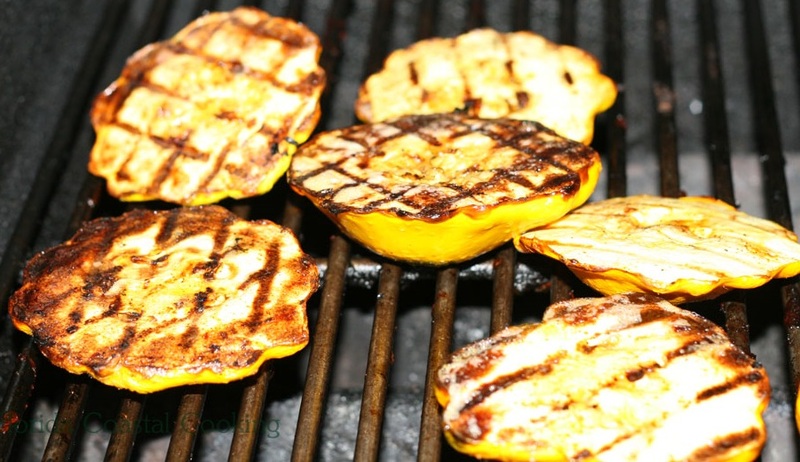 Alternately, you can grill the nectarines directly on the grill. Keep the nectarines warm while you prepare the other ingredients. 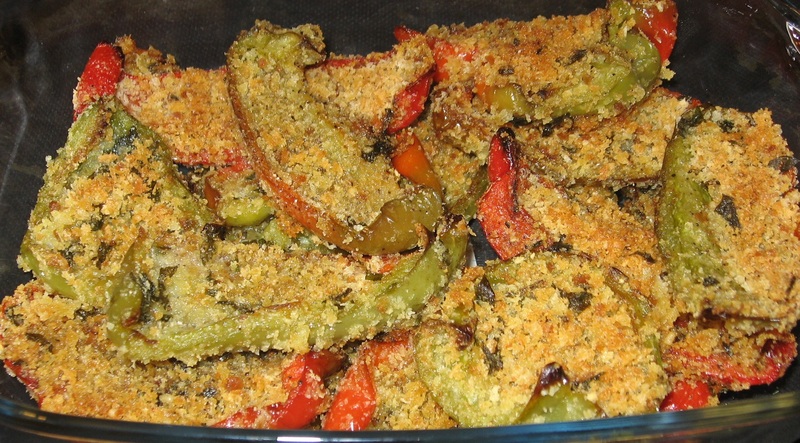 In a large bowl, combine the panko crumbs, flour, parmesan, salt, pepper and cayenne, mixing thoroughly to combine. In a small bowl, lightly beat the eggs. Take each slice of fresh mozzarella and coat it in the beaten egg, then dredge it through the bread crumb mix, pressing on both sides to adhere. Repeat with the remaining slices. Add the remaining olive oil to the skillet and when hot, saute the coated mozzarella slices, turning carefully once, until golden and the cheese starts to melt but still retains its shape, about 1 minute on each side. Drain on paper towels. 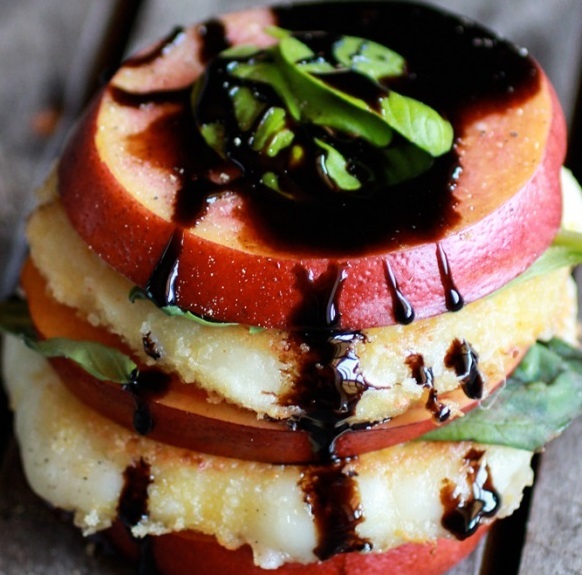 To assemble: place one nectarine slice on a plate, top with 1 slice of mozzarella and then a basil leaf. Repeat the layer one more time and finish with a nectarine slice. Garnish with basil and freshly grated pepper. Drizzle on the balsamic glaze. Bring all ingredients except the plums to a boil. Stir in the chopped plums. Reduce the heat and simmer very slowly until thick and syrupy, about 45 minutes. Depending on your preference for consistency, either puree in small batches in the blender, blend with an immersion blender or mash with a potato masher. The sauce may be made two days in advance. Heat an outdoor grill. Bank the coals on one side, so that one half is very hot and one half can be used for indirect cooking. If you have a gas grill, turn off one burner after the grill heats. Brush the hottest part of the grill with a little oil so the pork won’t stick. Pat pork tenderloins dry with paper towels. Lightly salt and pepper them on all sides. Sear the pork on all sides over the hot side of the grill. 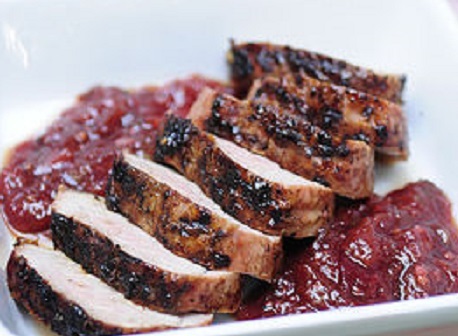 Move the pork to the indirect heat, brush liberally with some plum sauce and cover the grill for about 8-10 minutes. Total cooking time, including searing is 15-18 minutes. If you have a thermometer, cook to 155 degrees F.
Heat some plum sauce in a small saucepan on the stove or the grill. Remove the pork from the grill and tent with foil, allowing the meat to rest for 5-10 minutes. Slice the tenderloins. 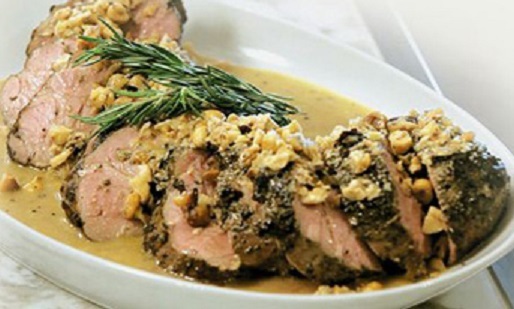 Pool the plum sauce on the plate and serve with the sliced tenderloin fanned out on top. This dish goes well with garlicky, sautéed greens. Combine 4 cups milk, rice and sugar in a saucepan. Bring to a boil, reduce heat and simmer until rice is tender, about 30 minutes. Remove the pan from the heat and stir in the salt and vanilla. Whisk egg yolks and about 1/2 cup of hot milk mixture together in a small bowl. Whisk back into the pan and add the remaining 1 cup milk. Place over medium heat and cook until thickened, about 5 minutes. Let cool and chill at least 2 hours before serving. 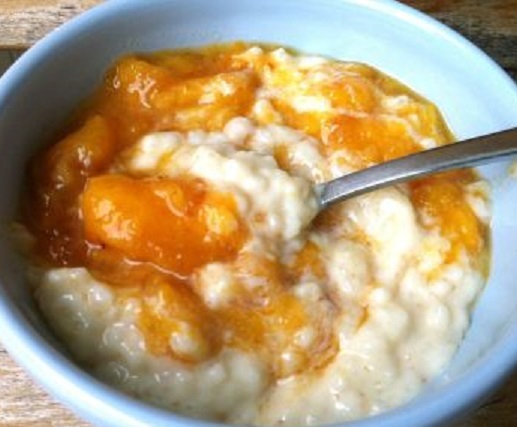 Top with mashed peaches. Blackberries were plentiful this year where I live. I had more than enough to use in fruit salads and decided to make this dessert. Preheat the oven to 350 degrees F. Coat a 2 quart baking dish with cooking spray. In a large bowl combine flour, brown sugar,the 1/4 cup granulated sugar, cinnamon, salt and oats. Using a pastry blender, a fork or your hands cut in the butter. Keep mixture cold until ready to use. In a large bowl combine berries, 1/2 cup granulated sugar and clear gel or cornstarch; toss to coat. 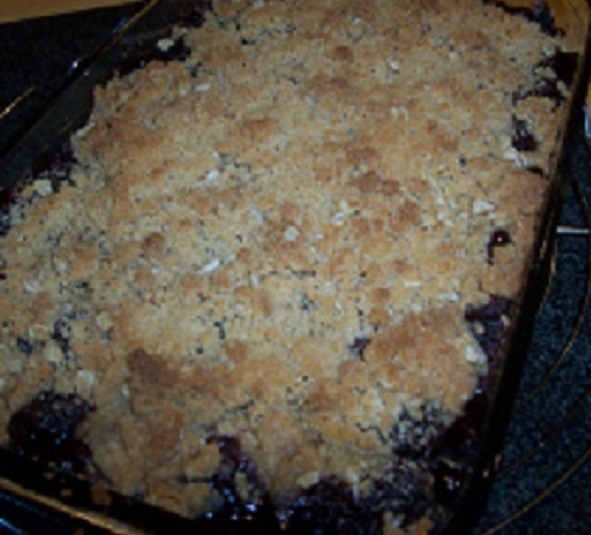 Pour the blackberry mixture into the prepared baking dish. Top with the crumble topping. Bake until the top is golden and the fruit is bubbly, about 35-40 minutes. Serve warm. 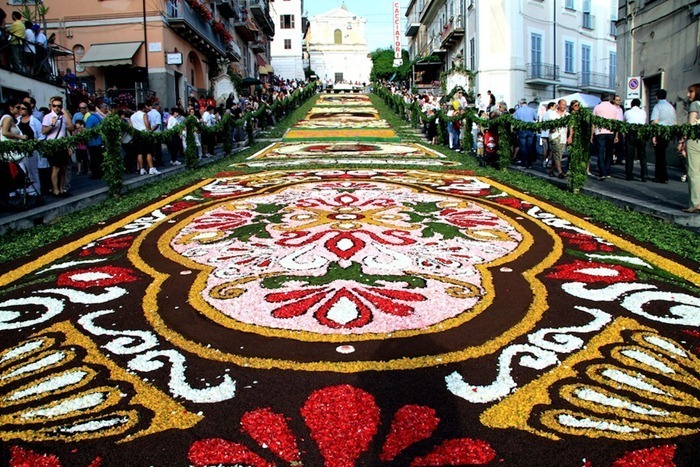 The “Infiorata Festival” is an Italian tradition that sees the streets paved with flowers during the month of May and June, from North to South, they are held in various Italian towns where these festivals take place. Individual artists display their talents on side streets and the public is invited to browse the “street gallery”. 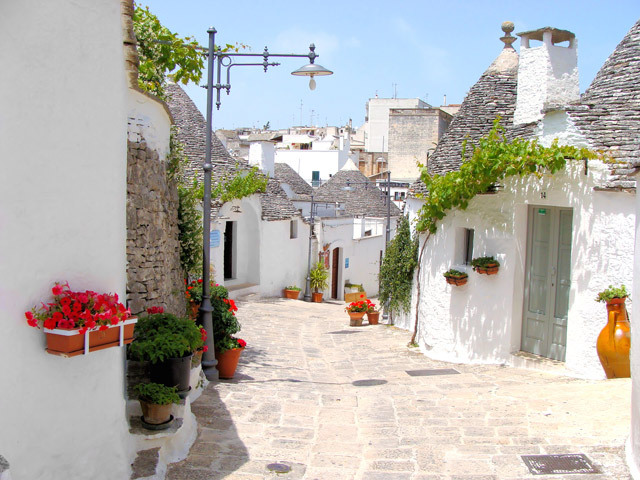 Three festivals in particular are worth noting: Noto – Sicily, Genzano – Lazio and Spello – Umbria. 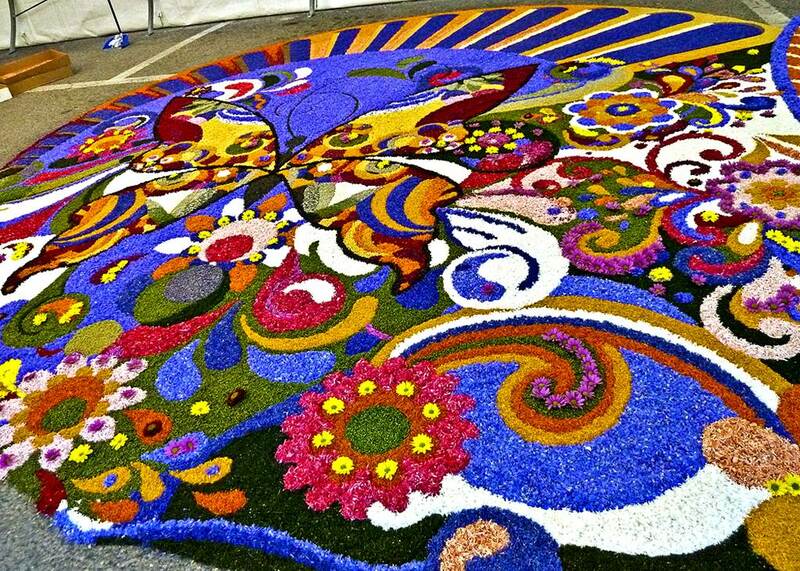 The word “infiorata” literally means “decorated with flowers” and this is exactly how the paintings created for the occasion are made, using flower petals, earth and, sometimes, even beans or wood cuttings. Tracing its origins to the 13th century, the Infiorata flower tradition, as we know it today, dates back to the seventeenth century. 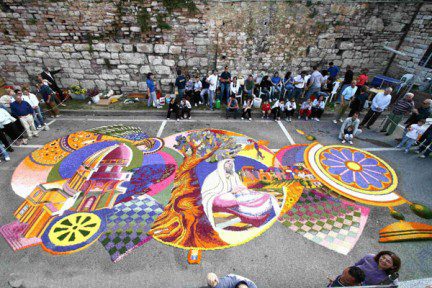 The infiorata artists use flower petals of varying colors to create both simple and elaborate designs on the streets leading up to their churches and abbeys. After months of work on the actual designs, the next step is to sketch them on the floor in chalk and mark each line with soil or coffee grounds. Then comes the job of filling in the designs with flower petals, using individual petals the way painters use the colors on their palette. Some tapestries also use entire flowers and other greenery, making for three-dimensional scenes. 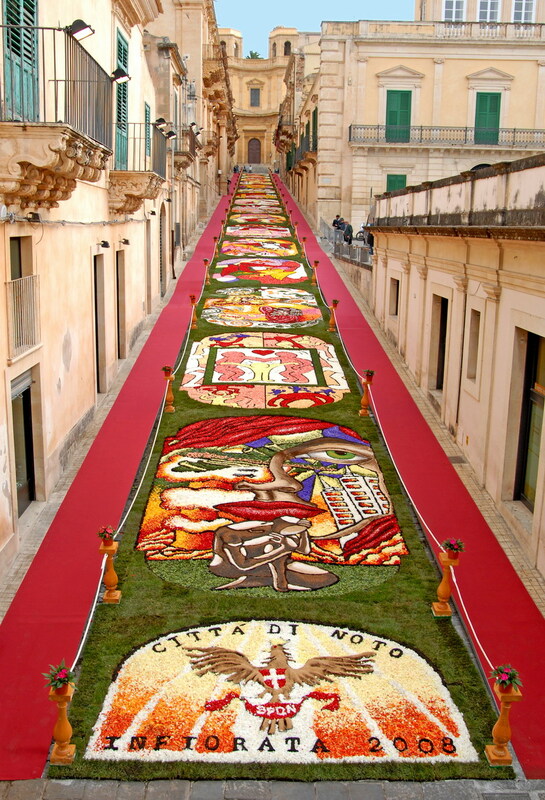 One of the most famous infiorata festivals is in Noto and takes place between the 16th and 18th of May. 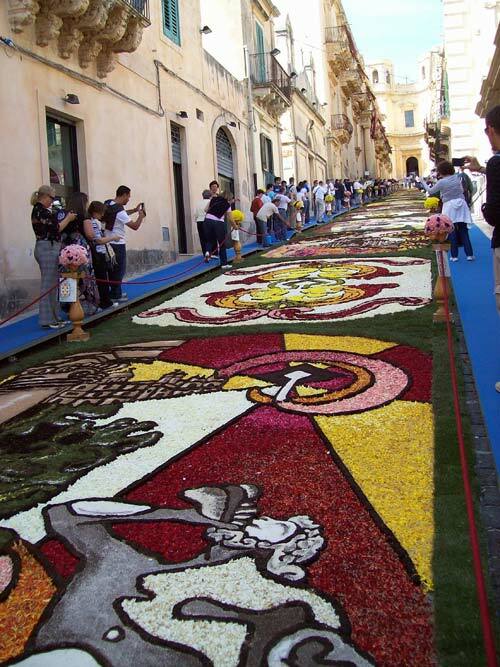 Noto is a beautiful town in southeast Sicily and, over the three festival days, the city is quite literally covered in flower petals for the “Infiorata di Noto”. This event has taken place since 1980 and it’s a celebration of Spring and a chance for local artists to display their skills while using the most natural materials possible: flower petals, earth and, sometimes, beans or wood cuttings. 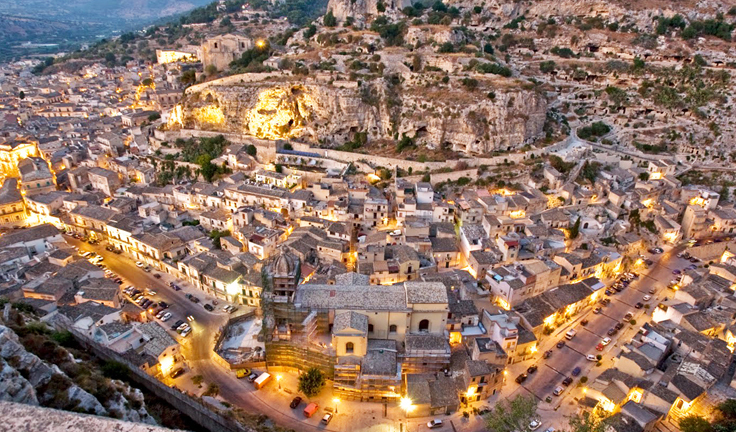 The entire town of Noto takes part in the design of these unbelievable creations that have a maximum life span of 48 hours – since they are prepared between a Friday and Saturday and are showcased on Sunday. The main viewing area is in the Via Nicolaci, where people can look down to enjoy the flower images. June is really a beautiful time of year in Genzano di Roma. 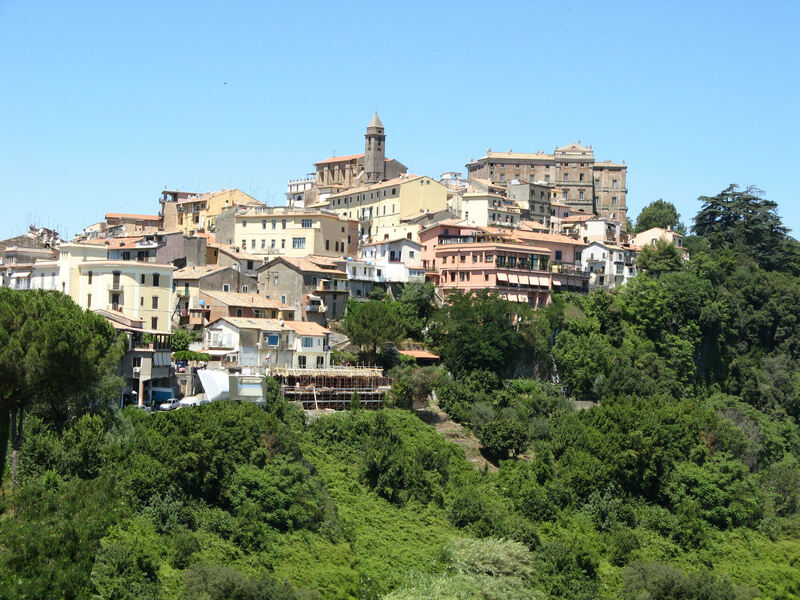 This small town is located about 18 miles (29 kilometers) away from Rome. 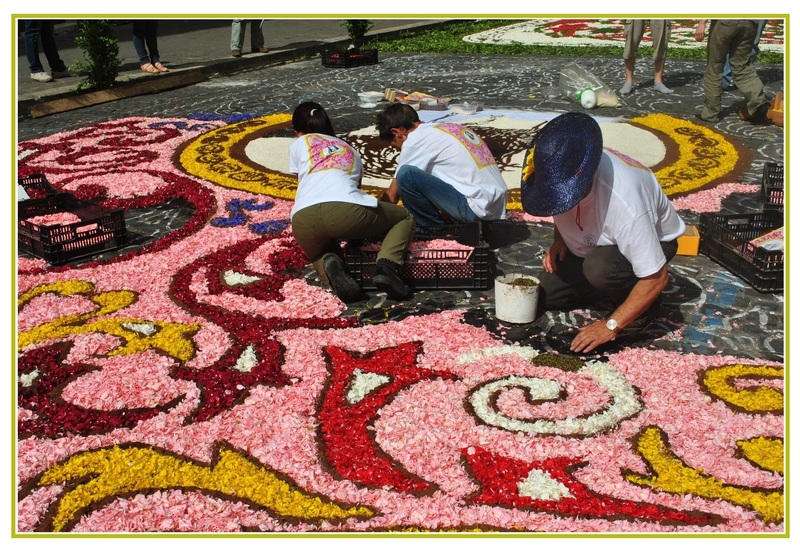 The tradition of making flower carpets along the route of the Corpus Christi procession started in 1778. 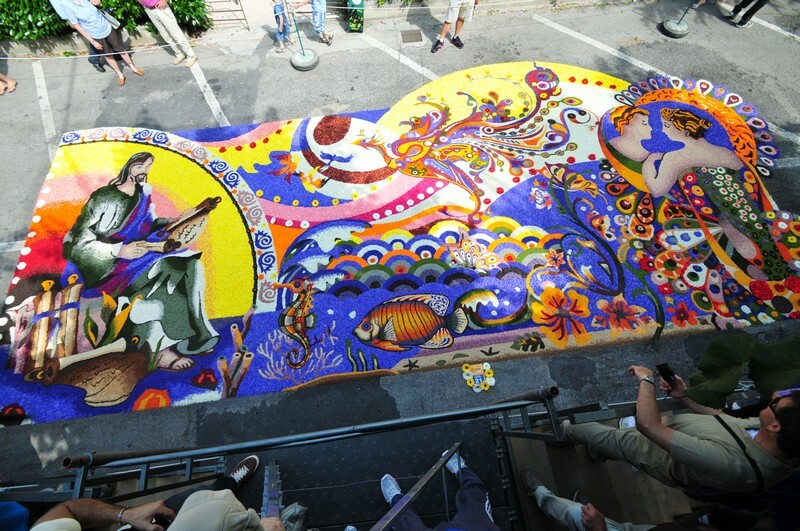 In 2014, the infiorata will be held on the 22nd and 23rd of June. 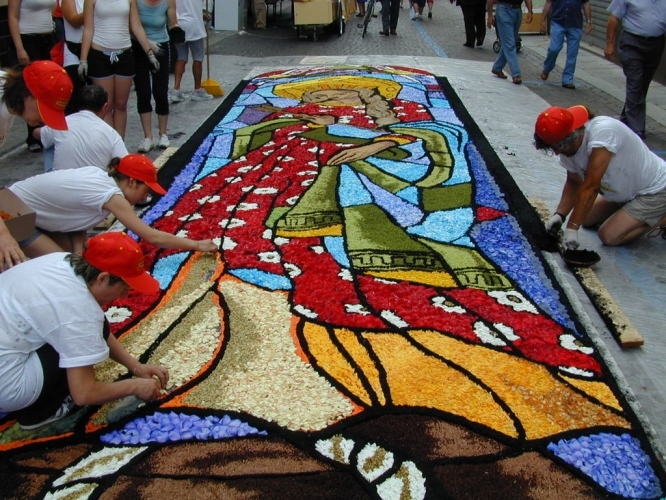 During this festival the whole Italo Belardi street is covered with flower carpets. In the past there were carpets dedicated to women, ecology, the late Pope John Paul II, Italian history, etc. In the 1990’s, several Italian fashion designers, for example Gianni Versace and Laura Biagiotti, participated in the festival. 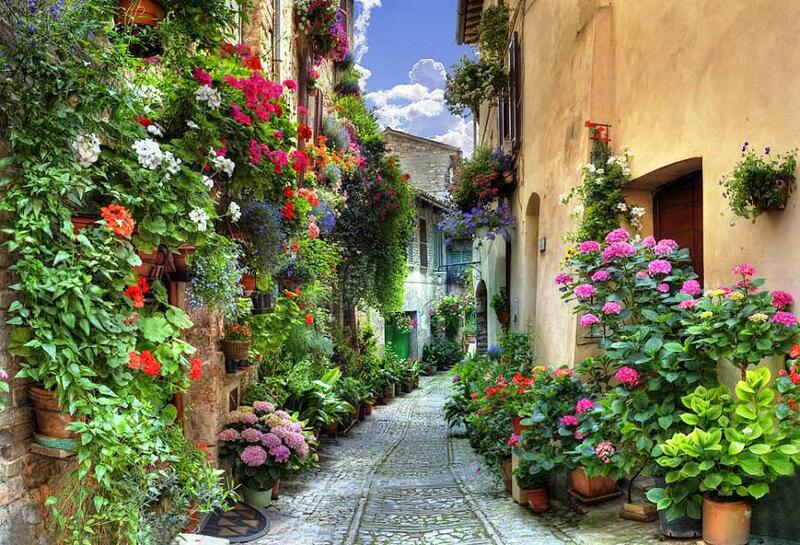 Spello’s Infiorate takes place every year on the occasion of the Corpus Domini feast. On that night, thousands of people work nonstop to create carpets and pictures made of flowers along the narrow town’s streets. The floral creations cover the streets throughout the historical center in preparation of the passage of a religious procession by the bishop on Sunday morning. The result is a unique mile-long carpet path of beautiful floral creations. 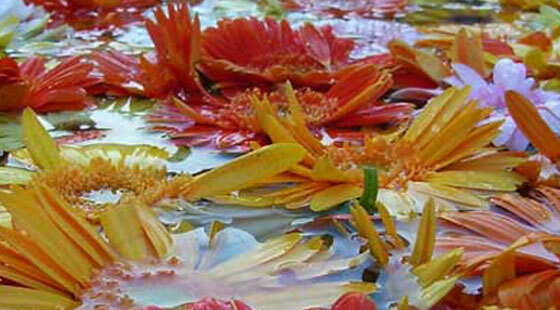 The custom of throwing flowers or creating flower compositions is a dateless event in many areas of the world. In Spello this tradition, which has gone from first throwing flowers, then to placing them in art forms on the pavement, is documented in the Municipal archives for the first time in 1831. As techniques evolved, what was once a long uninterrupted carpet of flowers characterized by a relatively simple design, morphed into sophisticated and larger compositions. Distinct groups of creators emerged, focusing on improving artistic execution and addressing more complex religious and social messages. Spello’s Infiorate creators compose their carpets using only flowers collected in the wild. While the use of other parts of the plants, like leaves and berries is allowed, the preference is given to the use of petals only, either fresh or dried. The use of wood and any kind of synthetic material is prohibited. From Sicily to Liguria, these Italian artistic carpets with flower petals are the pride of the citizens and local artists, who make use of local resources in their designs. During the course of the events, there are artistic and educational workshops, thematic conferences and many musical events. The only landlocked region in Italy, Umbria is located almost in the center of the country and there are no metropolitan cities in the region. With the Apennine Mountains to the east and Tuscany to the west, Umbria’s terrain is a mixture of pastureland, hills and forests. Wheat, spelt, pearl barley, grapes, olives, lentils, red potatoes, sunflowers and fruits and vegetables of all kinds grow well in the fertile lands of Umbria and provide the basis for hearty Umbrian cooking. Abundant, as well, are forest animals like deer and wild pigs, providing game meats and venison as hearty elements to many Umbrian dishes. Pork products in particular are the reason chefs worldwide seek out meats from this area. Prosciutto di Norcia is made exclusively from the meat of pigs fed only acorns to give the meat a distinctive woodsy flavor. Farro is a member of the wheat family and is related to emmer, spelt and similar grains. It has a nutty taste and a chewy texture. Farro tolerates poor soil and high altitudes, which is why it has been grown for centuries in the mountains of Tuscany, Umbria and Abruzzi. Farro labeled “semiperlato (partly pearled)” will cook faster than ordinary farro and farro labeled “perlato (pearled)” will cook even faster. If you encounter completely untreated farro, soak in water overnight before cooking. In a soup pot, warm the garlic in the olive oil over low heat for a few minutes without browning the garlic. Discard garlic. Add herbs, bay leaf, celery and onion. Cook, stirring, for 5 to 10 minutes, or until the onions are soft and just turning golden. Add the farro and squash, turn the heat to medium and cook, stirring, for 5 minutes. 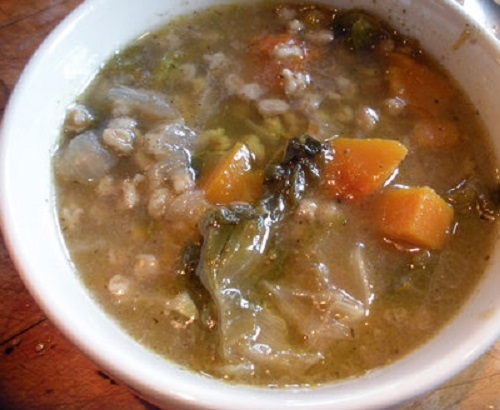 Add the greens and stock and simmer for at least 30 minutes, or until the farro is tender, but still a little chewy. Salt and pepper to taste. The region of Lazio is often seen as the center of Italian culture. Its mountain-to-sea terrain offers a rich variety of landscapes with growing and producing conditions close to ideal. Oxtail, veal, pork, lamb, spaghetti, gnocchi, bucatini, garlic, tomatoes, truffles, potatoes, artichokes, olives, grapes, buffalo mozzarella and pizza … the choices are overflowing. Lazio has developed food that is a great example of how the simple dishes of the poor working classes influenced the cuisine of the country. Add to this a heavy influence of Jewish culture and delightful and unexpected combinations emerge: pork with potato dumplings or artichokes stuffed with mint. Very little is wasted in Lazian cooking. Almost any bit of this or that leftover – vegetables, herbs, oils, cheeses, cream, meats – can be combined with each other and with spaghetti for a delicious meal that can range from light to hearty. Whisk together milk, semolina and 1 teaspoon salt in a 2-quart heavy saucepan and bring to a boil over moderate heat, whisking. Simmer, stirring constantly with a wooden spoon, until very stiff, 5 to 8 minutes. Remove from the heat and stir in 2 tablespoons butter and 3/4 cup Parmigiano-Reggiano. Beat in egg. Spread gnocchi mixture 1/2 inch thick on an oiled baking sheet and chill, uncovered, until very firm, about 1 hour. 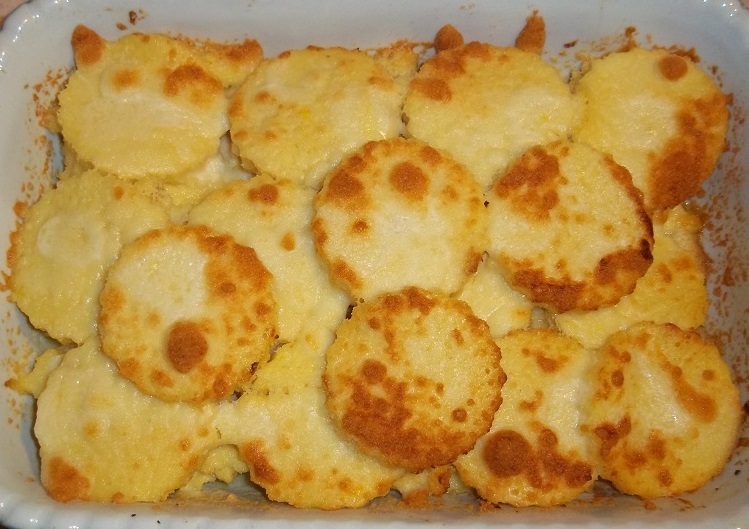 Cut out rounds from the gnocchi mixture with a 2-inch round cookie cutter (push scraps into remaining mixture as you go) and arrange, slightly overlapping, in a well-buttered 13 by 9 inch baking dish. Make a small second layer in the center of dish with any remaining rounds. Brush gnocchi with remaining 1/4 cup melted butter and sprinkle with remaining 3/4 cups Parmigiano-Reggiano. Bake in the middle of the oven until gnocchi are beginning to brown, 15 to 20 minutes. Let stand 5 minutes before serving. 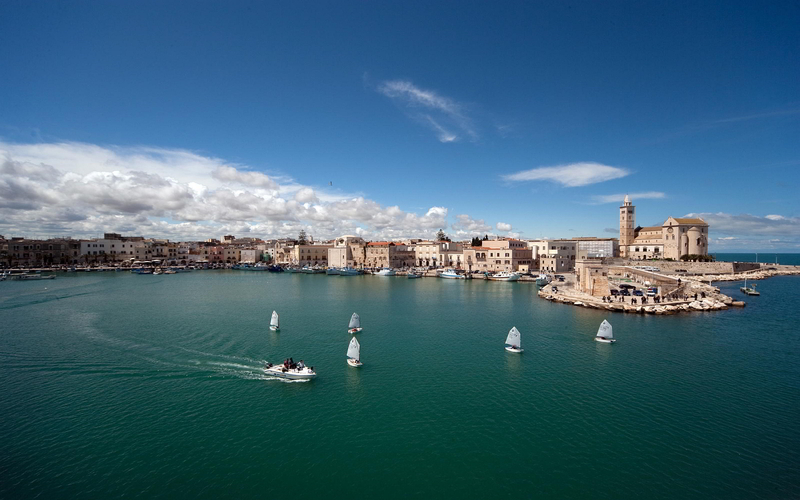 The island region of Sicily is located in the warm Mediterranean waters right off the toe of southern Italy’s “boot”. 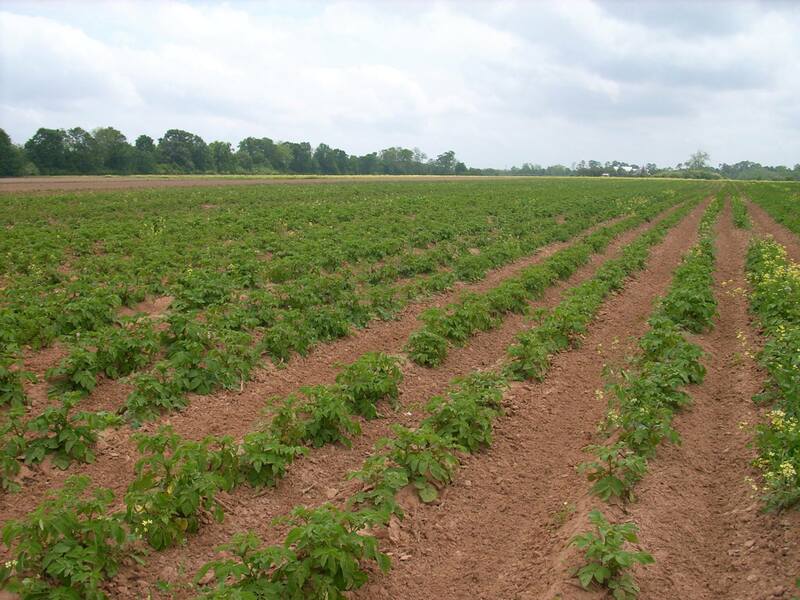 The mountains and hills provide excellent locations for growing a wide variety of food products. The western part of the island is devoted to growing grapes and is rich in the winemaking tradition. Wheat grows well on the high plains areas. The southern tip of Sicily is known for almonds and the northern hills for chestnut and walnut trees. The citrus orchards are some of the most abundant on the planet. Swordfish, sea bass, cuttlefish and tuna are coastline staples. Deer roam wild and pigs are raised for pork and sausage dishes. Cow, sheep and goat herding is a traditional practice, providing plenty of meat, as well as, milk for local cheeses. Caciocavallo (“cheese on horseback”), a cow’s milk cheese, gets its distinctive teardrop shape from being left hanging to dry in pouch-like bags. 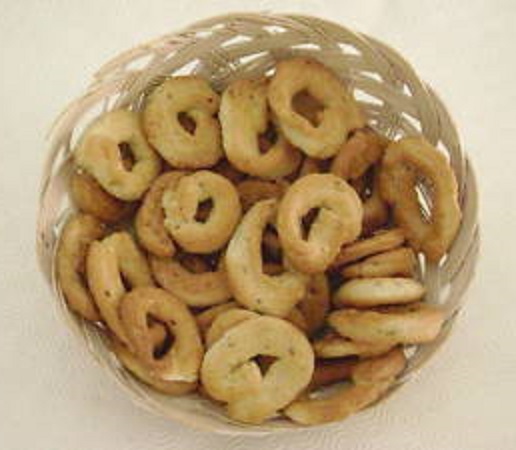 Many of the flavors introduced into Sicilian cuisine have taken influence from African trade coming through the region and so the additions of apricots, melons, pine nuts, cinnamon, cloves, nutmeg and saffron are not unusual in Sicilian dishes, including the more traditional Italian elements of tomatoes, olives, eggplants, beans and peppers. Sicily is home to many sweets the world has come to equate with Italian cuisine. This region is master of the well-known cannoli, fried pastry tubes most often filled with smooth and sweetened ricotta cheese. Trim any excess fat and skin from the chicken and set aside. Heat oil in a large nonstick skillet over medium heat. Place the chicken in the skillet; cook 2 to 3 minutes until browned. Turn the chicken; sprinkle with black pepper. Scatter garlic cloves around the chicken; cook 2 to 3 minutes until browned, stirring garlic as needed. 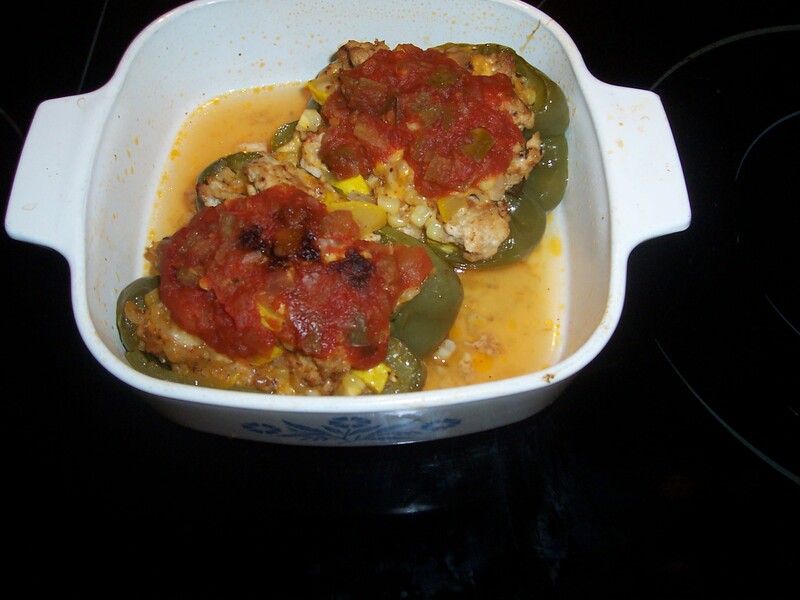 Add bell pepper and olives to skillet; sprinkle herbs over the chicken and peppers. Pour wine into skillet. Bring to a boil; reduce heat and simmer, covered, about 20 minutes or until the chicken is cooked through. Meanwhile, prepare pasta according to package directions for al dente. Drain and place in a serving bowl or a platter. 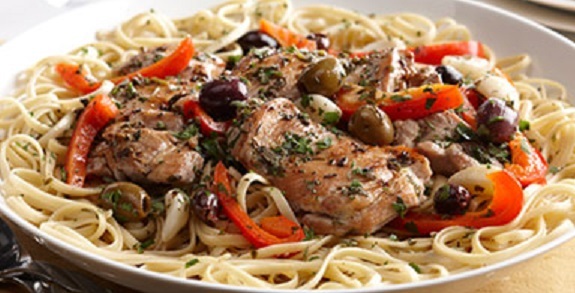 Remove chicken and peppers from the skillet and arrange over the pasta. Stir vinegar into the pan. Bring to a boil and pour over the chicken and pasta. Garnish with fresh herbs, if desired. Hazelnuts have been cultivated for more than 5,000 years. The hazel part of its name comes from the Anglo-Saxon word “haesel” meaning a headdress or bonnet, referring to the shape of the outer shell covering. Hazelnuts are native to Asia Minor and they spread to Italy, Spain, France and Germany via Greece. Prior to the 1940s, hazelnuts were imported to the United States. Today, they are grown commercially in the Northwest US. In the food industry, hazelnuts are currently eaten raw, roasted, blanched, minced, sliced, powdered and pureed. Hazelnuts are also used as a premium ingredient in chocolates, biscuits, confectionary products, sweets, pastries and ice cream and in sauces and salads. Hazelnuts are about the size of a small marble. The nut meat is encased in a hard shell that resembles an acorn without its cap. The nut meat has a bitter brown paper-thin skin that is removed before eating. These nuts contain 88 percent unsaturated oil, which is pressed for use and known as the delicately flavored hazelnut oil. Although it cannot be heated to high temperatures, this oil is favored by gourmets worldwide and is relatively expensive. Hazelnut cooking oil has a similar composition to extra virgin olive oil with high content in Omega 9 and Omega 6 fatty acids. This makes hazelnuts another healthy cooking oil option with flavorful taste. Why are hazelnuts sometimes called filberts? Well, there doesn’t seem to be one explanation. The most commonly accepted explanation is because hazelnuts mature on or around St. Philibert’s Day on August 20. Other historians believe the term filbert derives from the German, vollbart meaning full beard, a reference to the appearance of the husked shell. Hazelnuts are also known as cob nuts in some areas. Other experts claim these are all different varieties of the nut, but once shelled, they are quite difficult to tell apart. 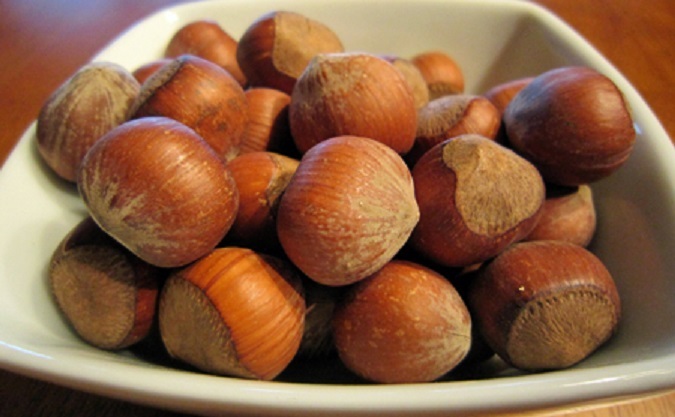 Check hazelnuts for freshness by picking up a nut and shaking it. If it rattles inside the shell, this is an indication it has lost moisture due to age or mishandling and is now stale. The shells should be free of cracks or holes. Most markets now carry shelled and ground hazelnuts, which can be quite a timesaver in the kitchen. At room temperature, unshelled hazelnuts seldom last more than a month. Once shelled, they should be eaten as soon as possible. Shelled hazelnuts should last unopened up to 4 months in the refrigerator or 1 year in the freezer. Hazelnut oil is more fragile. Store the oil in the refrigerator for up to 3 months. Hazelnut oil should be used sparingly. A little goes a long way. Avoid heat when using hazelnut oil so as not to sacrifice its delicate flavor. When adding to sauces, remove the pan from the heat and whisk in at the last moment. For full flavor, roast and cool raw shelled hazelnuts before grinding or chopping. To remove the paper skin, spread shelled hazelnuts in a single layer on a baking tray and roast at 275 degrees F (130 C), stirring occasionally, for about 15 minutes until the skins begin to break. Roll in a clean kitchen towel, let rest for 10 minutes, and then gently rub back and forth to remove the skins. Some bits of the skin may remain. Bring hazelnuts to room temperature before using. 2-1/4 pounds hazelnuts in the shell = 1 pound shelled nut meats. 1 pound hazelnuts in the shell = 1-1/2 cups nut meats. 1 pound shelled hazelnuts = 3-1/2 cups. 1 cup shelled = 5 ounces. 4 ounces ground, lightly packed = 3/4 cup. 1 ounce ground, lightly packed = about 3-1/2 Tablespoons. Macadamia nuts may be substituted for hazelnuts. Remove the core of each pear using a melon baller keeping the pear intact. Place the wine and grape juice in a large saucepan. Add the pears, bring to a simmer and cook gently for 25 minutes or until tender turning them as needed, then remove pan from the heat and cool the pears for about 10 minutes in the liquid. Remove pears from the poaching liquid, transfer to a plate and let cool. Discard liquid. Place nuts on a baking sheet and bake until the nuts are golden brown, about 12-15 minutes, tossing occasionally. Remove pan from the oven and set the nuts aside to cool; then rub the skins off with a kitchen towel. Roughly chop the nuts and set aside. In a large mixing bowl, combine the shallots and vinegar. Slowly add the oil while constantly whisking to blend. Whisk in the water and season the dressing with salt and freshly ground black pepper. Cut each of the poached pear halves into 4 wedges. 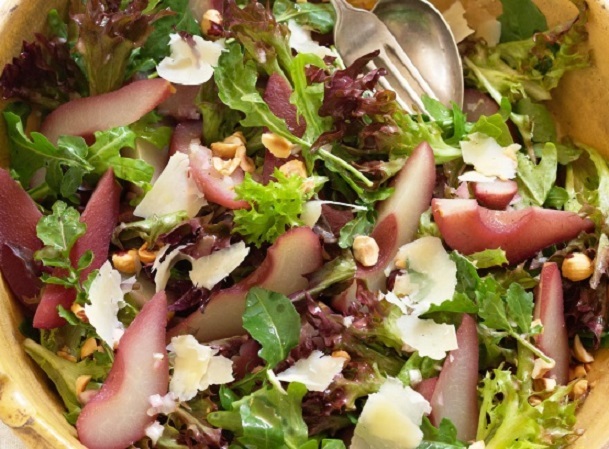 Toss the arugula, red lettuce, parsley, pears and half of the nuts in a large mixing bowl with enough dressing to lightly coat the leaves. Season to taste with salt and pepper and gently mound the salad onto a serving platter. Garnish with the remaining nuts and Parmesan cheese and serve. 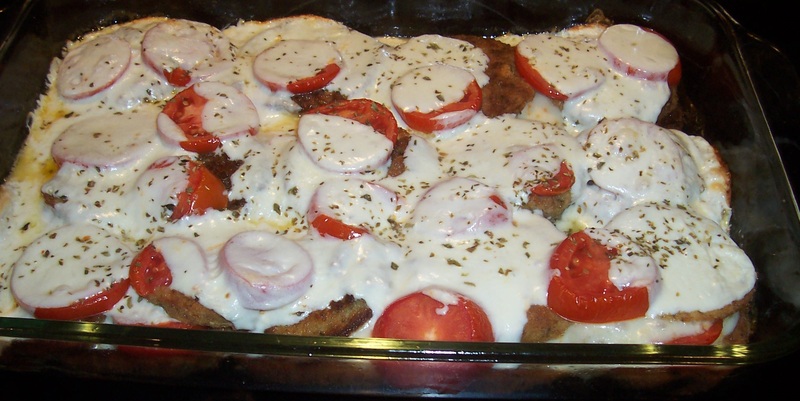 Slice each chicken breast half into 2 cutlets. Place cutlets between 2 pieces of waxed paper or plastic wrap. Using a mallet, pound each piece to about 1/3-inch thickness. Sprinkle pounded chicken with salt and pepper on both sides. Melt butter with oil in a heavy large skillet over medium-high heat. Add chicken to the skillet and sauté until lightly browned and cooked through, about 1 1/2 minutes per side. Transfer chicken to plate; cover to keep warm. Add the shallot to the same skillet and sauté until tender, about 3 minutes. Pour in the Madeira and bring to boil, stirring to scrape up any browned bits. Add cream; boil until sauce thickens slightly, about 2 minutes. Stir in hazelnuts. Season sauce with salt and pepper. Pour sauce over the chicken and serve. Rinse the dried lentils and place them in a medium saucepan with 1 ½ cups water. Bring the water to a rapid simmer over medium-high heat, then reduce the heat to maintain a very gentle simmer. You should only see a few small bubbles and some slight movement in the lentils. Cook, uncovered, for 20-30 minutes. Add water, if needed to make sure the lentils are just barely covered. Lentils are cooked as soon as they are tender and no longer crunchy. Older lentils may take longer to cook and shed their outer skins as they cook. (The best way to tell if they are cooked is to taste one.) Drain the lentils. Return the lentils to the saucepan and stir in 1/4 teaspoon of salt. Combine lentils, onion, bread crumbs, parsley, egg and hazelnuts. Stir in thyme, basil, salt and pepper. Mold into 4 burger-sized patties. In a large skillet over medium-high heat, heat the vegetable oil. Add patties and brown on both sides. Remove from heat and drain on paper towels. 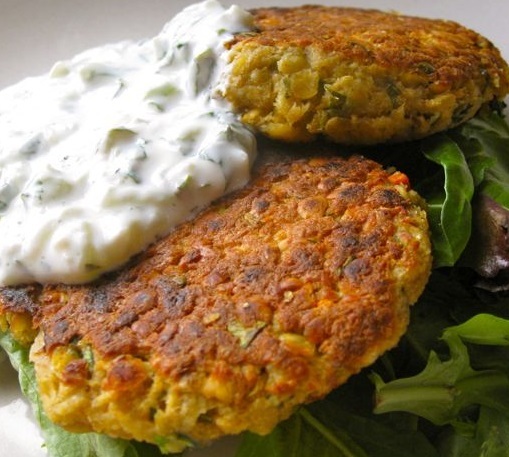 Transfer onto a serving platter and serve with Tzatziki sauce. In 3 separate shallow bowls, place the flour, egg and hazelnuts. Add the salt and pepper to the flour. Dip the pork, on all sides, including the ends, first in the flour, then the egg and finally the hazelnuts. Make sure to coat the pork pieces completely with the nuts. 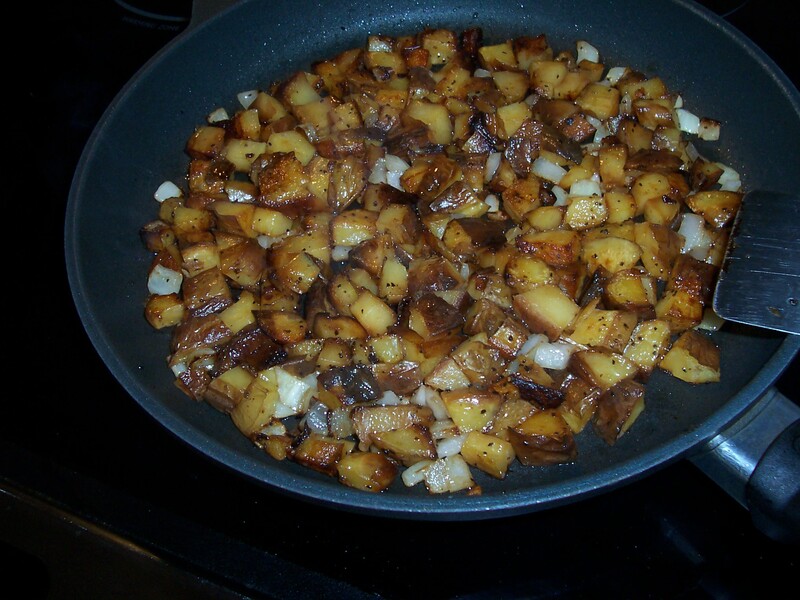 In a 10-inch skillet over moderate heat, heat the vegetable oil and saute the pork on all sides until golden brown. Transfer the browned pork to a baking pan and roast for 20 minutes, or until the internal temperature of the pork reaches 160 degrees F.
Add the olive oil to the pan used to brown the pork. Saute the shallots over medium high heat until lightly browned. Sprinkle flour over the shallots and cook for 1 minute, stirring constantly. Stir in the white wine, chicken stock, thyme, salt and pepper. Bring to a boil and cook until thickened. 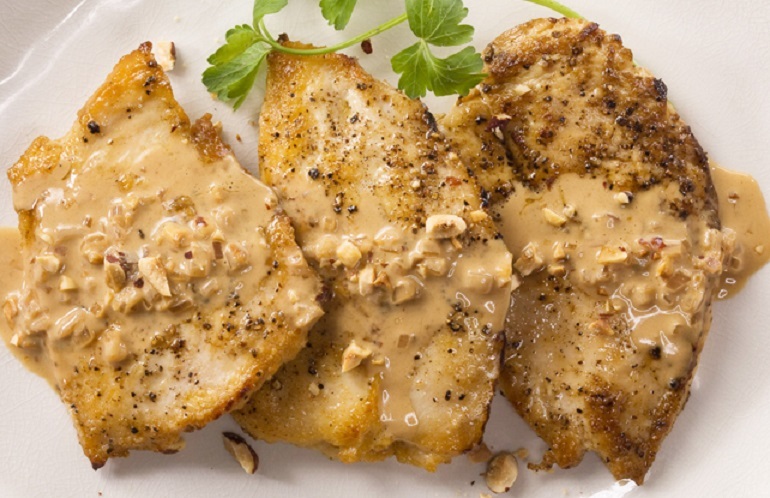 Cut the pork tenderloins into 1/2-inch slices and place on a serving platter. Top the pork with the sauce and garnish with rosemary. Toast whole hazelnuts on a baking sheet in a 275°F oven, stirring occasionally, 10-15 minutes. Let the nuts cool for a few minutes, then rub together in a clean kitchen towel to remove most of the papery skins. Position 2 racks as close to the center of the oven as possible; and turn the oven up to 325°F. Line 2 baking sheets with parchment paper or nonstick baking mats. Pulse nuts and sugar in a food processor until finely ground. Place in a large bowl. Beat egg whites and the salt in the large bowl of an electric mixer on high-speed until stiff peaks form. Using a rubber spatula, gently fold the egg whites into the nut mixture. Add vanilla and gently but thoroughly mix until combined. Drop the batter by the tablespoon, 2 inches apart, on the prepared baking sheets. Bake the cookies until golden brown, switching the pans back to front and top to bottom halfway through the baking time, 25 to 30 minutes. Let the cookies cool on the baking sheets for 5 minutes. Gently transfer the cookies to a wire rack to cool completely. When the baking sheets are thoroughly cooled, repeat with the remaining batter. Store in an airtight container for up to 1 week.